Although it's been almost four years since I took these pictures, this home is still as beautiful today and one of my favorites. Walking down a street of remodeled homes from the 1800 and 1900's for me, is like letting a child loose in a candy store. These homes are absolutely amazing. I could walk through these neighborhoods for hours and never tire of the beauty and architecture. The revitalized Historic Districts in Indianapolis has brought renewed life to the streets and homes here. Many of the people here are new, some have lived here a very long time and have seen the changes first hand. I met Carol, one of the residents there, while walking. She has lived in Lockerbie Square for 17 years. She allowed me to take some pictures of her gardens and the outside of her home. 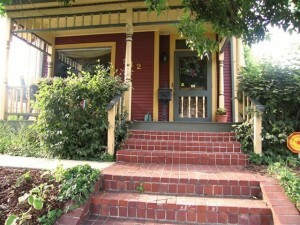 This is a beautiful three story Victorian on two lots.